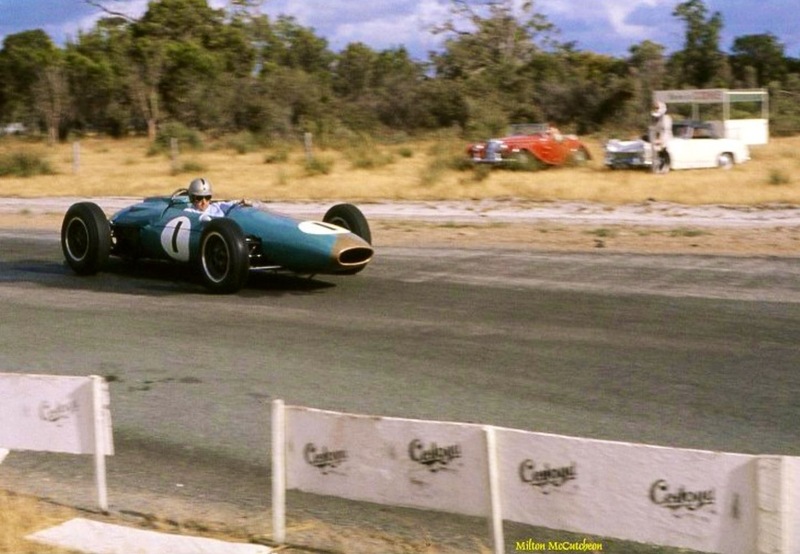 Photographer John Ellacott upon posting this shot online described it as ‘the two great rivals on Hume Straight’…Matich braking down the outside on the run into the slow second gear ‘Creek Corner’. 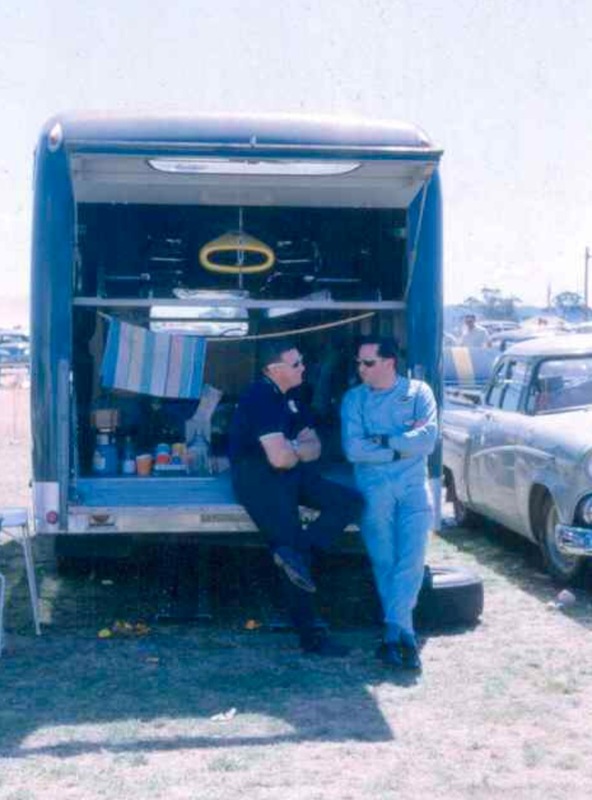 Frank’s car was brand new, just unpacked, it had only turned a wheel for the first time several days before the 1 December ‘Hordern Trophy’, the final round of that years Gold Star, the Australian Drivers Championship. Frank’s car was fitted with 2.5 litre ‘Climax FPF, Bib’s older chassis had an ‘Indy’ 2.7- a fair duel, one guy with the edge in chassis perhaps and one with a bit more power? Stillwell led from the start of the 34 lap race and then FM began to reel him in finally catching the Victorian on lap 20, the pair tangling in ‘The Esses’. The collision was enough to put Matich out of the race but Stillwell finished 4th, the race was won by John Youl in his Cooper T55 Climax 2.5 from David McKay’s ex-Brabham BT4. In the 1964 Tasman Series which followed the month after this race Youl was the most successful of the locals. Stillwell only contested three Australian races gaining a strong second in the AGP at Sandown whilst Matich was prodigiously fast but had woeful reliability, we shall pick up the Tasman shortly. 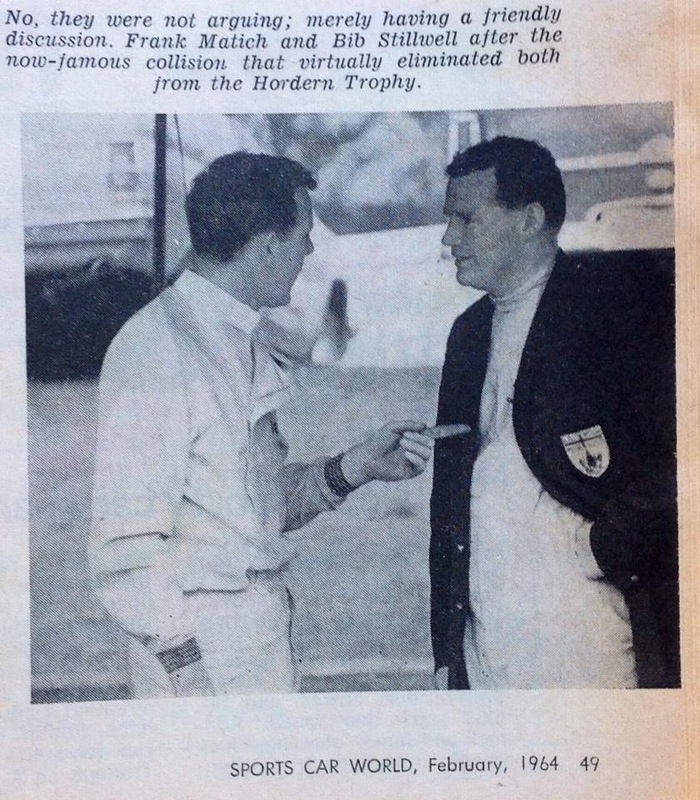 I described the rivalry between Frank and Bib in a post about the Stillwell Cooper Monaco. It’s fair to say Stillwell, born 31 July 1927 took a while to mature as a driver. He started racing MG’s in the late 1940’s and as his motor dealerships became more successful throughout the 1950’s he acquired and raced some expensive, fast cars- D Type Jag and Maser 250F included. By the time he commenced racing Coopers he had well over 10 years of experience and was ready to take on anybody winning his first Gold Star in 1962 and the last in 1965- four on the trot. Matich, born 25 January 1935 was a more precocious talent who first competed in an MG TC at Foley’s Hillclimb circa 1954 and raced seriously from later in the decade after selling his Austin Healey and purchasing the ex-Frank Gardner Jaguar XKC- he soon drove cars for Leaton Motors who employed him as Sales Manager. Bib was more the ‘silver spoon special’ born on the right side of the tracks and funded into his first dealership with family money. Mind you, whatever Bib started with he multiplied many times over, he was an extremely successful businessman in Australia and then became an executive of global calibre inclusive of being President of the Gates Learjet Corporation in the US. Frank, the young pro, was cut from totally different cloth. He was educated at De La Salle College, Marrickville in Sydney’s inner west and was apprenticed as a fifteen year old Diesel Engineer at Sydney’s Kurnell Oil Refinery before progressing through Butlers Air Transport and in 1954 to Selected Sportscars where he first came into contact with the Englishman who owned the MG TC Frank prepared and both men raced. FM’s ability and ‘gift of the gab’ attracted patrons and commercial support from very early on in his career, Matich too was shortly to do well out of the business of motor racing with Australian franchises for Firestone and later Goodyear racing tyres and Bell helmets apart from the sale of some of the Matich sports and F5000 cars he built. Matich and Stillwell were intensely competitive, driven, successful men- they had far more in common i suspect than not, especially in terms of mindset and will to win. The battles between the pair were absorbing, Matich very quickly got on the pace of the big 2.5 Climax Formula Libre cars (the 2.5 Tasman Formula started in 1964, Australia’s national F1 ‘ANF1’ was F Libre till then), having come out of powerful sportscars- Jags C and D Types, Lotus 15, 19, 19B and small bore single seaters- ‘works’ Elfin FJ Ford and Elfin Catalina Ford 1.5. 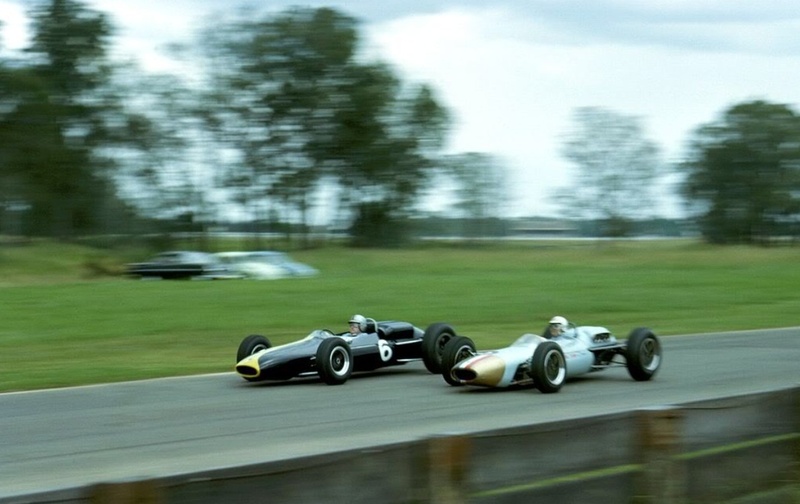 At the time these 2.5/2.7 litre F Libre/Tasman cars were the fastest road racing cars in the world, F1 having changed from a 2.5 to 1.5 litre formula from 1 January 1961. Given his experience it was not a surprise when Frank was on the pace straight away as he jumped out of his Lotus 19B sporty and into the new Brabham acquired with the French Oil Company, Total’s, support. 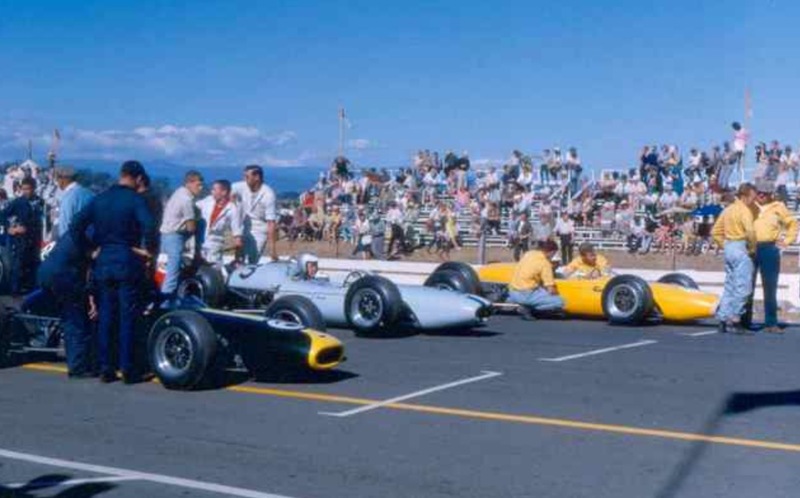 Well before the Tasman Series commenced in 1964, we had a strong International Series of races in Australasia in January/February, with enough of the best in the world to test the locals in equal cars Matich was more than a match for any of them. So was Bib on his day. 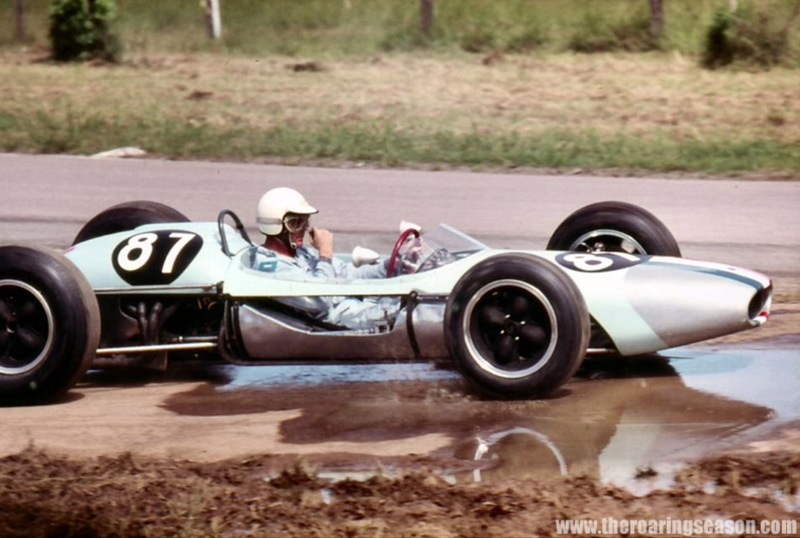 Matich was very quick in the Brabham throughout that ’64 Tasman Series and the short period in which he raced the BT7A, its interesting to look back at his time in the car. 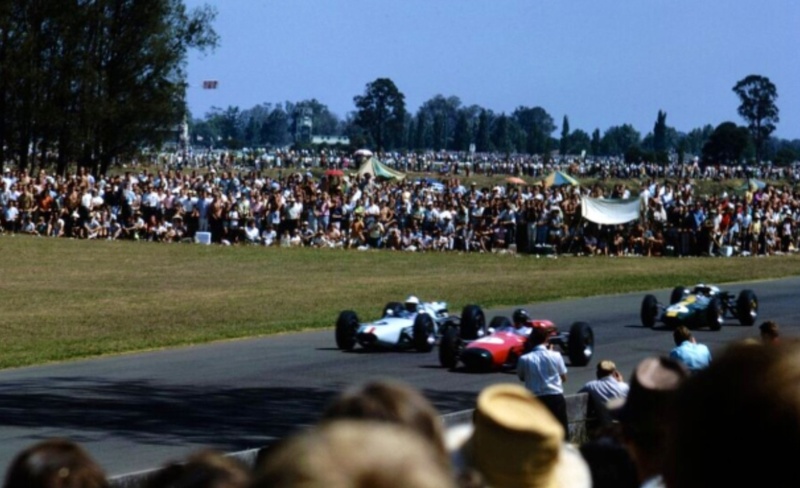 The first 1964 international was at Levin, which Frank missed, at Pukekohe, the NZ GP on 11 January, he ran strongly behind Brabham, McLaren, Tim Mayer and Hulme- he passed Mayer for third only to pop his engine on lap 26, McLaren won the race in a Cooper T70. After Puke he shipped the car home to Australia and re-joined the circus at Sandown on February 9. There he ran ahead of the locals before suffering crown wheel and pinion failure on lap 4. At the Farm, Matich’s home turf, he started from pole, followed Jack away, then passed him but muffed his braking at Creek and ran off the road. Off to Queensland, at Lakeside, he was driving away from everybody before the engine let go- a Weber ingested a stone and the expensive motor went ka-boom on lap 8. After the long tow to Tasmania he finished third in the race won by Graham Hill’s BT4 and was first of the locals despite a misfire and a revolution amongst his mechanics who pushed the car onto the grid but left his employ after the race. Ray Bell wrote that ‘He had a mixed bag of results in shorter races during the middle part of the year, taking a number of outright lap records, then came the Gold Star closing events. Lakeside…pole and the lead before an oil line came adrift; Mallala he didn’t turn up (Stillwell basically could not be beaten for the Gold Star by this stage) and he led the Hordern Trophy till half distance before yet another engine failure’. 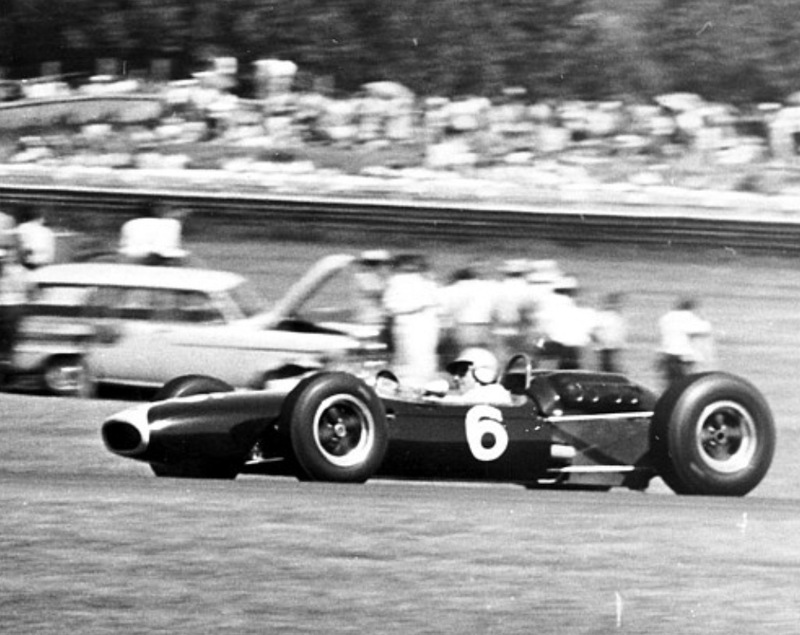 The 1965 Tasman Series was won by Jim Clark’s Lotus 32B Climax, despite not contesting the four Kiwi rounds Matich was right on the pace at Warwick Farm, the first Australian round, starting from pole and leading to Creek corner, he then raced with Brabham behind Hill and Clark up front. ‘Both Hill and Matich had troubles in this race with cement dust getting into the steering, Hill spinning on the last lap because of it and failing to finish. 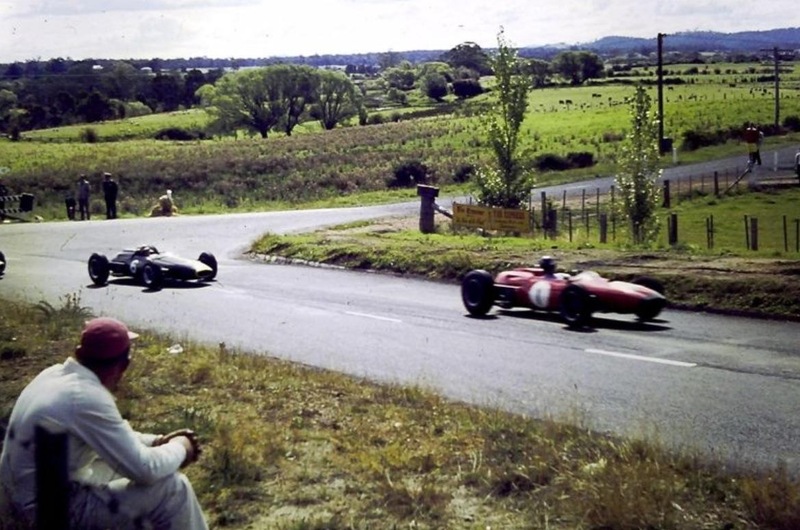 Matich was third behind Clark and Brabham’s BT11A, Stillwell (BT11A) was thirty seconds behind him’ wrote Bell. Down south at Sandown he ran just behind the internationals ahead of Stillwell only to retire with ignition failure- a rotor button on lap 10. During the AGP at Longford he pitted with suspension problems on lap 5 whilst best of the locals having run in sixth place. At Lakeside he contested the non-championship ‘Lakeside 99’ and made it a real race dicing with Clark on this high speed, demanding circuit for most of the race. ‘They traded places many times, but Matich did have a pitstop and lost some laps before rejoining the battle’. It was a race FM rated as one of his best. Into the domestic season Stillwell won the Victorian Road Racing Championship Gold Star round in April after a couple of Matich spins, albeit FM was second despite a failing engine- and started from pole a half-second clear of Bib. That was all the racing he ever did in that car. 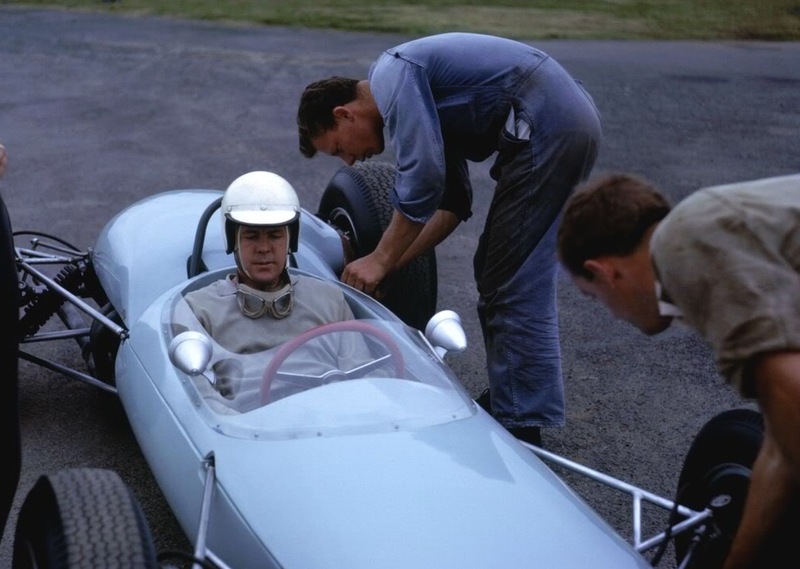 At Lakeside’s Gold Star round in late July, he crashed his Lotus 19B Climax- he took the sportscar to the meeting to test it in advance of the Australian Tourist Trophy which was held at the circuit later in the year, was burned and hospitalised and in the aftermath Total took the decision to cease their racing program and sold the cars and parts. The story of the next phase of Frank Matich’s career in sportscars, initially with the Elfin 400 aka ‘Traco Olds’ is told in links within this article. Frank Matich was one of Australia’s many F1 mighta-beens, to me the most likely to succeed of all, but with a young family and business ties in Oz it never happened despite offers being made to him on more than one occasion to go to Europe. It’s a shame he didn’t drive Tasman 2.5 cars throughout this golden-era of single-seater racing in Australasia, his battles against the internationals as well as the local hotshots in both Tasman races and domestic Gold Star competition would have been sensational, Matich mixing it with Bartlett, Martin, Geoghegan, Harvey and the rest would have added depth to Gold Star fields which were increasingly ‘skinny’ as the decade wore on. Stillwell retired at the end of 1965, he was certainly as quick as anybody on his day and arguably had not quite peaked when he did retire. 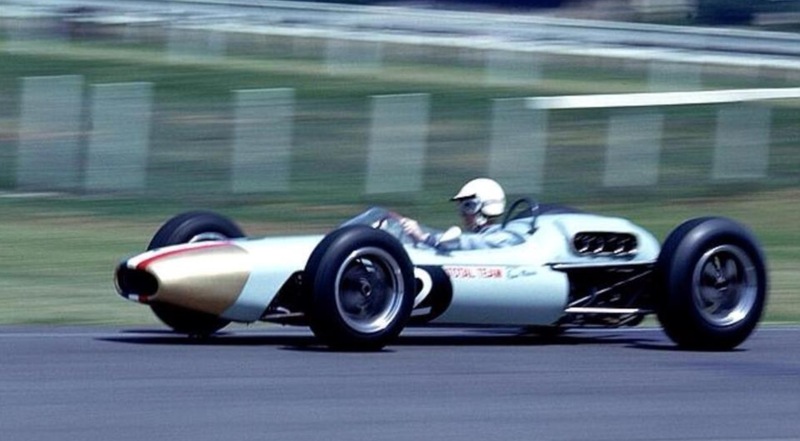 No less an observer of the local scene than journalist/racer/Scuderia Veloce owner David Mckay believed that by 1965 Stillwell had reached F1 standard, not least for his ability to drive fast without mistakes or destroy the equipment. When Jack started his climb to the top in Europe he returned and raced in Australia each summer, bringing a Cooper with him and racing it successfully, then selling the car to one of the locals before returning to Europe. It was a nice little earner and helped fund his way in Europe as he fought to gain a toehold in international competition. Cooper sold a lot of cars in Australia, Jacks business brain was as sharp as his cockpit skills so it was natural that some of the earliest Brabham production racing cars were for Australasian Formula Libre and from 1964, the 2.5 Tasman Formula- which in effect meant cars built for Coventry Climax FPF ex-F1 engines- 2.5 litres but increasingly 2.7’s after Jacks successful Indy 500 run in 1961 in the Cooper T54 with its 2751cc FPF engine. The Tasman Formula mandated 2.5’s of course. Soon Repco were making Climax parts and eventually building the engines in totality under licence in Australia. The bits were plentiful which was just as well as the level of competition was such that the long stroke donks were being pushed well beyond their limits with spectacular blow-ups fairly common. The first Intercontinental Brabham, i use that descriptor as that was the chassis prefix for each car (‘IC’), the design intended for the shortlived Intercontinental Formula created in response to the new 1.5 litre F1- was the BT4 based on the first Brabham GP machine, the 1.5 litre Coventry Climax FWMV V8 powered BT3. The first Brabham, retrospectively referred to as ‘Brabham BT1’, was the MRD, an FJ machine first raced by Gavin Youl with the BT2 an evolution of the MRD/BT1. 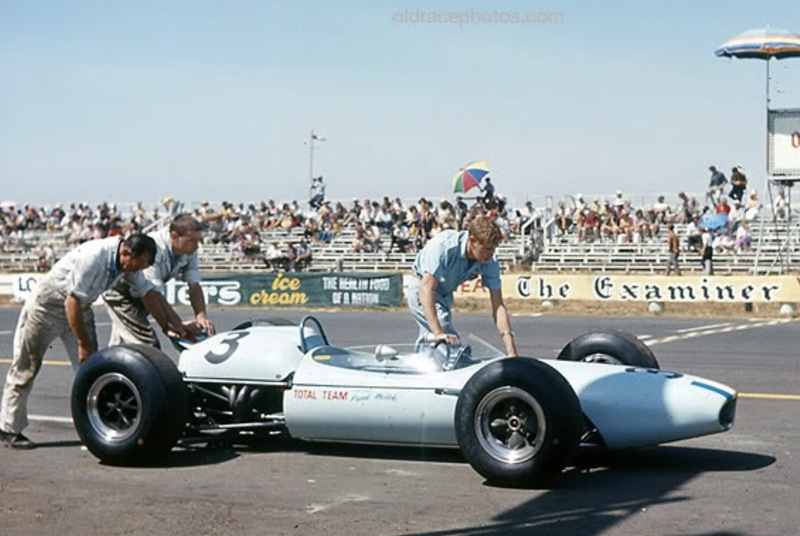 The Intercontinental cars which followed the BT4 were the BT7A in 1963 and BT11A in 1964, both F1 cars adapted for Climax FPF engines. Some incredibly talented guys raced the ‘IC’ Brabhams- Internationals such as Brabham, Hulme, Gardner, Hill and Stewart as well as Australian champions including David McKay, Lex Davison, Stillwell, Matich, Spencer Martin, Kevin Bartlett, John Harvey, John McCormack and other drivers in New Zealand and South Africa. 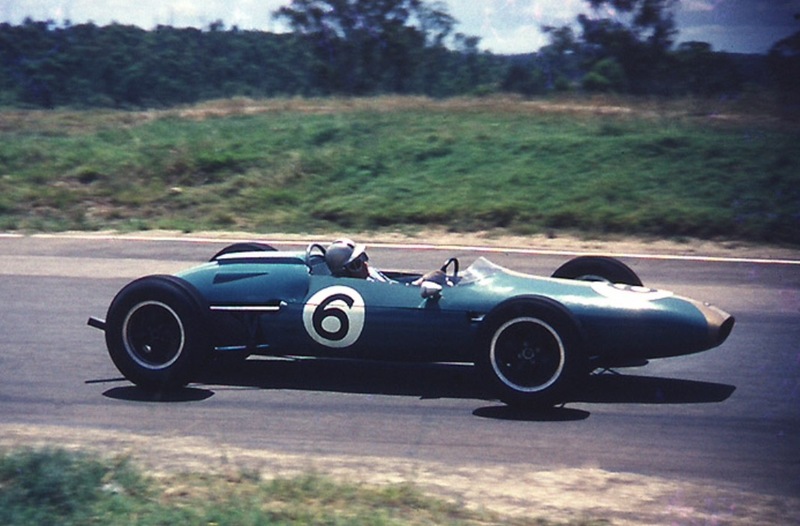 Jack Brabham won Australian Grands’ Prix in a BT4 and BT7A in 1963 and 1964 respectively. 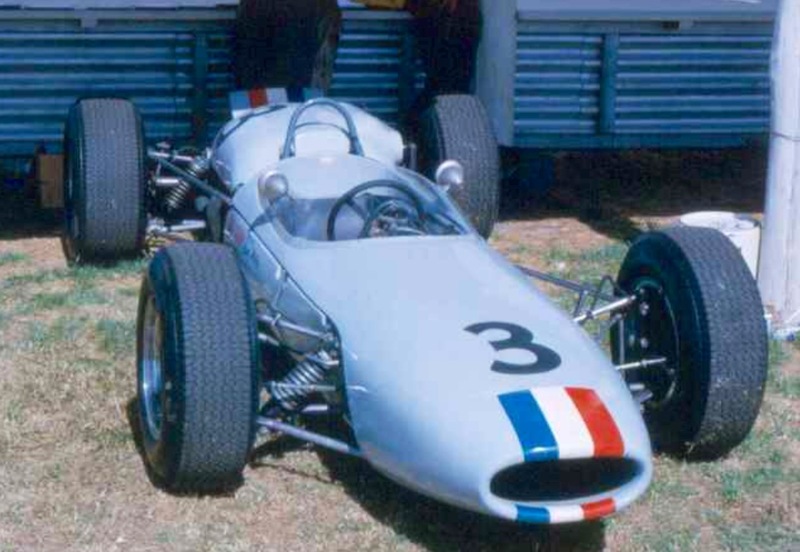 The cars won the Australian Drivers Championship, the ‘Gold Star’ for Stillwell in 1963 and 1964 aboard his BT4, in 1965 with a BT11A and for Spencer Martin, again BT11A mounted in 1966 and 1967. The ‘Brabham IC Australian party’ ended in 1968 when Kevin Bartlett won the Gold Star in BT23D/1, a one off car built for Alec Mildren’s Team around Alfa Romeo Tipo 33 2.5 V8’s he secured to add a bit of Italian flavour to the local scene, Mildren was an Alfa Romeo dealer. The Intercontinental cars were typically fast Tauranac designs of the period. They had rugged spaceframe chassis, suspension by upper and lower wishbones at the front with Armstrong shocks and coil springs. At the rear there was a single upper link, inverted lower wishbone, twin radius rods and coil spring damper units with adjustable sway bars fitted front and rear. With Jack doing all of the initial chassis setup work the cars were quick and chuckable ‘straight out of the box’. Hewland HD5 gearboxes were used in the main (Colotti in the BT4) and rack and pinion steering completed the package with the cars clad in a slippery fibreglass body. 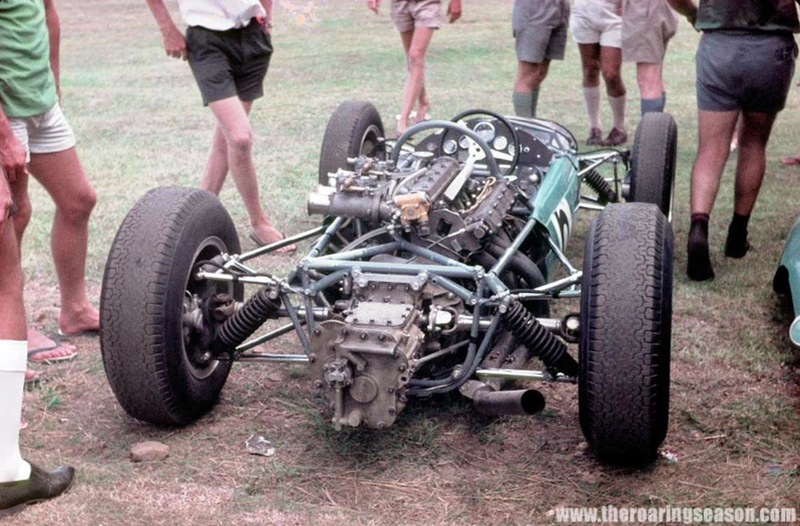 Once the 1.5 litre F1 ended in 1965 BRM quickly realised a stretched variant of their P56 V8 in a P261 chassis would be a Tasman winner and ‘their endeth the locals’ in Climax engined cars taking on the Internationals similarly mounted on more or less equal terms. The Repco Tasman V8’s provided a supply of competitive customer engines for locals so the Tasman Formula continued into 1970 with engines capable of matching the internationals when the ever expanding F1 season and more restrictive driver contracts made eight weeks in January/February in Australasia no longer a proposition for the best in the world. With it went a wonderful decade or so of intense but sporting summer global competition in our backyard. 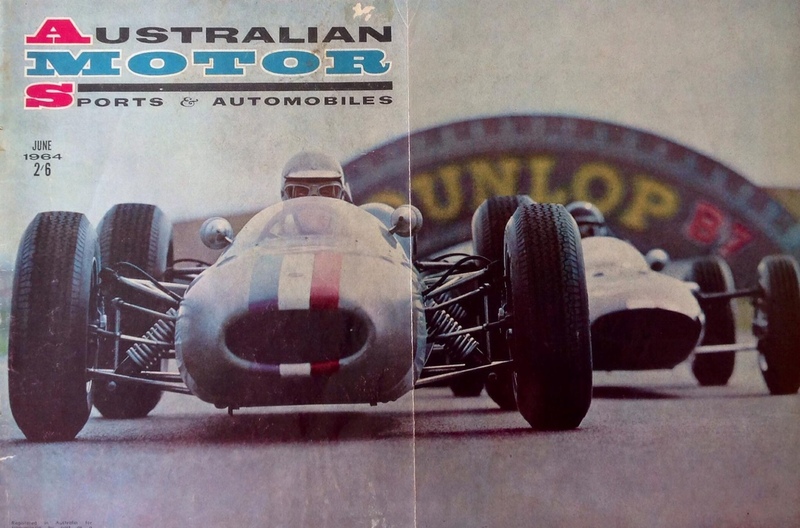 Front page spread in ‘Australian Motor Sports’, no advertising allowed on racing cars in Australia in those days but the colors on the nose of Franks’ Brabham (Leo Geoghegan’s Lotus alongside) are those of ‘Total’ the French oil company who were prominent in Australia at the time, the spread no doubt a ‘cross promotion’ as the modern marketers would call it! 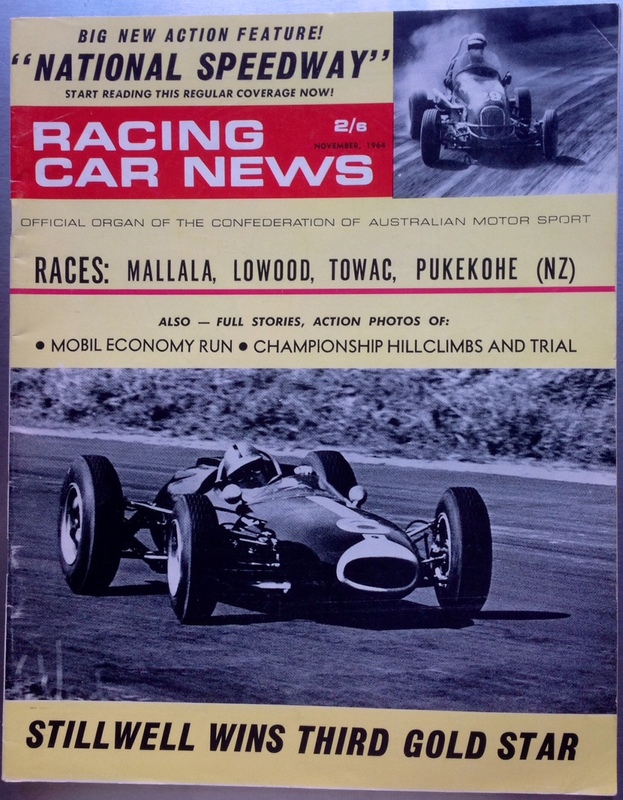 ‘Racing Car News’ and Stillwell’s Gold Star win in 1964. Brabham BT4 Climax. We always seem to remember our “first”, for me the 1963 Horden was my first Warwick Farm meeting. The 2.5’s seemed awesome, big powerful and fast, and as you mention the fastest road racing cars in the world. A big selling point, for a young impressionable mind. BTW, F1 had been reduced to 1.5 Litres in 1961. The “Intercontinental” formula was of course started by the Poms, who were refusing to accept that F1 would really be reduced to 1.5 Litres. As usual you’ve written a really nice article, brought back lots of memories. I can’t decide which was our best era, the 2.5 ANF, or the Brutal F5000’s. So to stop my head from exploding I’m giving them equal billing! Appreciate picking up the errors which I have fixed. I missed the 2.5 era going to my first meeting in 1972 and love the F5000’s as I did and still do,that Tasman Formula with those cars and those drivers, gotta be hard to beat! The research was available to rattle off the fate of all the T51 Coopers which stayed in Australia in a recent article, I was going to have a similar crack at a list for IC Brabhams but gave up- it would be interesting to know where they all are- for sure not too many are still in Oz. I was surprised to read that Matich drove ” ‘works’ Elfin FJ Ford and Elfin Mallala Ford 1.5.”. I concur with the FJ part of that assertion but I can’t place when and where he would have driven a Mallala. Any thoughts? I must suss the Elfin bible but my recollection (always dangerous) is that FM raced three works Elfins- a Clubman, FJ and some races in a Cosworth Ford 1.5 pushrod engined machine. Thanks for the email re this, I seem to have consistent dyslexia when it comes to Mallalas and Catalinas! Have changed the text to Elfin Catalina, a 1.5 litre single-seater as against the Mallala, a sporty!, albeit constructed from the FJ/Catalina ‘parts bin’. I have to confess to being a spectator at many of those races to which you refer. The debate regarding the merits of Matich and Stillwell will always depend upon whether you are a glass half full or a glass half empty person. Matich was supreme at Warwick Farm while Stillwell was supreme at Sandown. Stillwell was always able to bring the car home, Matich less able. Matich had the ability to produce the fastest lap, quicker in one lap than Stillwell, yet it was Stillwell who won four Australian Drivers Championships. For so many people of my vintage , we were privileged to witness two of the greatest drivers that Australia has produced. But I still have a very high regard for the man who won at Warwick Farm on that famous day and who in my humble opion could arguably be better than either Matich or Stillwell. His career ended all too quickly just when he was on the cusp of becoming The Best. As you say two great drivers with Matich becoming a better finisher as his career wore on. Your observation about John Youl is an interesting one- he clearly had the speed of the best despite not having the very latest of equipment albeit it was very well prepared by Geoff Smedley. Family pressures in running the family property(s) was the issue wasn’t it? Geoff’s book is nearly finished- it will be a beauty and provide wonderful perspective on both Matich and the Youl brothers. I’ve done a quickie article on John and his Porsche 356 which I must pop up in the next couple of weeks.